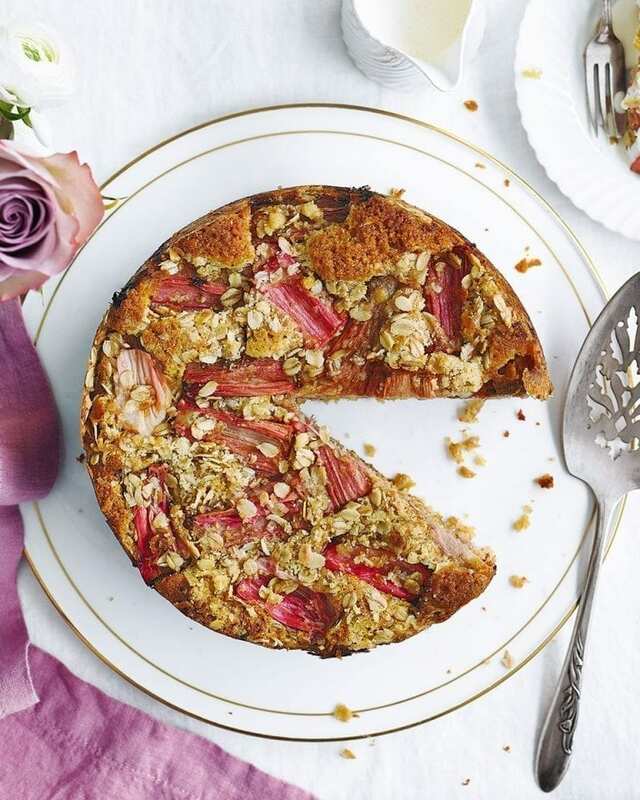 A golden, oaty streusel topping adds chewy flapjack-like texture to this wonderful rhubarb and ginger cake. It’s best served warm with plenty of crème fraîche, yogurt or custard. Heat the oven to 200°C/180°C fan/gas 6. Put the rhubarb in a roasting tray and toss well with the sugar, ginger and lemon. Roast for 15 minutes until soft. Set aside. Turn the oven to 170°C/150°C fan/gas 3½. Meanwhile make the streusel topping. Rub the butter into the flour in a mixing bowl, using your fingers, until it looks like fine crumbs. Stir in the oats and sugar, then set aside. For the cake, put the butter and sugar into another mixing bowl and, using an electric mixer, beat on a medium speed until light and fluffy. Whisk in the beaten eggs a little at a time then, using a large metal spoon, fold in the remaining cake ingredients using a figure of eight motion. Spoon half the cake batter into the prepared tin, then sprinkle with half the streusel. Pat the rhubarb dry on kitchen paper, arrange half on top, then top with the rest of the cake mix and smooth over. Sprinkle with most of the remaining streusel and top with the remaining rhubarb. Finally, sprinkle over the last of the struesel. Bake for 1 hour, then cover with foil and cook for another 55-60 minutes until the sponge is cooked through and the streusel topping is golden. Leave to cool in the tin on a wire rack for 20 minutes, then serve with cream, custard, thick yogurt or crème fraîche. This cake is great warm. If making ahead, briefly warm slices in the microwave. Make the cake up to 24 hours in advance; or freeze in slices, wrapped in baking paper, then cling film.